We offer exclusive range of Salwar Kameez in different texture, fabric with excellent material which is widely demanded in both Indian subcontinent and other country. 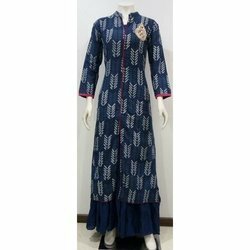 The salwar kameez includes Fashion Salwar Kameez, Georgette Salwar Kameez, Traditional Salwar Kameez, Ethnic Salwar Kameez, Cotton Salwar Kameez, Designer Salwar Kameez, etc. We provide our clients with a wide range of traditional salwar kameez in all colors and sizes. The traditional salwar kurtas offered by us are comfortable, ideal and fit for special occasion. 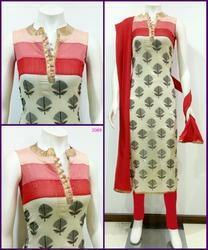 In this fast moving world where people are fashion conscious traditional salwar kameez has its own popularity. Therefore it is always in demand in indian fashion trend. With the help of our expert designers, we offer a designer collection of traditional salwar kameez to our valued clients. We are dealers of designer suits. Our clients can avail this georgette suits for a kind of casual look. These georgette suits are known for their quality and comfort. 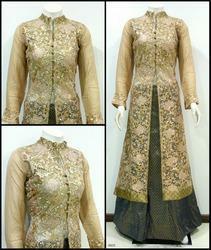 We are manufacturers of designer suits and ladies suits. We are here to end your search for authentic Indian designer suits. To meet the rising demands of the customers, we are offering Latest Salwar Kameez to our valued customers at minimal cost. Available in a plethora of colors, we offer ethnic salwar suits to our customers. Meeting the multicolored preferences and tastes of our customers, these suits are as per the modern trends of the market. These salwar suits are highly demanded by young girls as well as ladies, providing them a traditional yet gorgeous look. We offer a wide variety of ethnic salwar kameez that suits the style statement at both formal and informal occasion. We are leading wholesalers dealing in suits and dress material like latest designer suits, Indian designer suits, online suits, fashion suits, pure silk suits, Kancheepuram silk suits, kanchi silk suits. Suits have undergone great metamorphosis since times. This exclusive outfit is ages old but has walked step by step with changing times. It has never let women down with regards to styles. Various styles it comes in helped women a lot to change their appearance as per the need of hour. From traditional to modern, suits come in both forms in various styles. If seen today’s scenario then certainly demand for modern saris is more because women have become highly modern but still want to maintain that Indian look in their appearance. Salwar Kameez range is well liked for embroideries such as kanta, zari, and zardozi. The suits are also adorned with ravishing sequins and beads. Our suits are available with border-embroidered dupattas and can be customized as per the client’s requirements. Offers our wide range of embroidered suits that are perfect to be worn at formal occasions. Intricately embroidered and available in an extensive range of shades and patterns. Matching up to the demands of rich Indian tradition, Ethnic Wear choices offered are both exclusive and exciting to wear for all occasions be it parties, weddings and other special occasions. Further, the enchanting work done on its borders as well as support of exclusive booty work also make ladies look at their glamorous best as well as support needs of creating sense of exclusive style and rich looks as desired by the customers. Adding grace to wearer’s personality, the dazzling effect provided by these dresses and availability in vibrant color choices also make these excellent choice addition to one’s wardrobe. Looking for Unstiched Designer Salwar Kameez ?